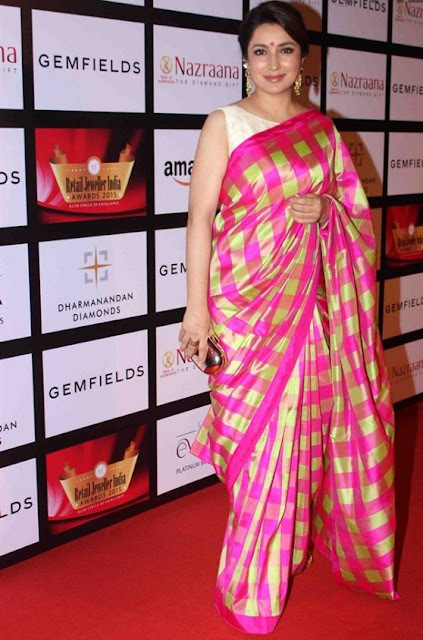 Saree is an iconic Indian garment and it is now preferred by many Indian celebrities even when they walk red carpets abroad. A lot of effort has been put into modernizing the saree but there is another trend these days of going back to the roots and wearing traditional handloom sarees. Indian Fashion scene is embracing traditional textiles and designers like Anavila, gaurang shah and Sanjay garg are being favoured by bollywood celebrities. Today I am going to talk about Raw mango a label by designer Sanjay Garg which deal in traditional handwoven textiles . Raw Mango is a brand by Sanjay Garg dealing in contemporary Indian handwoven textiles like saris, fabrics and stoles. Traditional techniques are fused with modern accents to make timeless classic designs. I love the use of vibrant colours in Raw Mango sarees and skillful craftman ship. Divya wore the pretty combination of blue and pink for the music launch of Sanam Re. A blue saree paired with pink full sleeve brocade blouse looked gorgeous and the addition of gajra in hair made the look more traditional. It was a good move to pair that high neck blouse with a choker type neckpiece and studs. 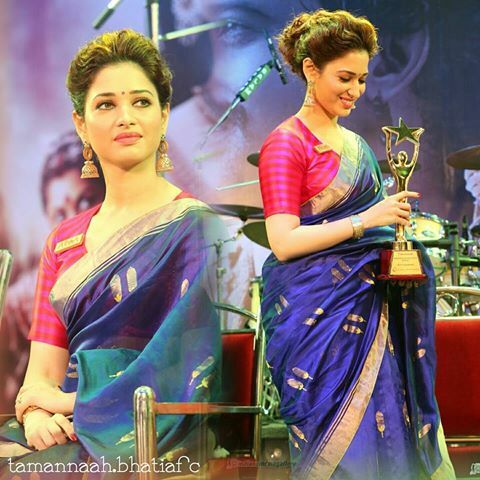 For Baahubali Malayalam Audio Launch Tamannah went the traditional route wearing an Indigo and gold chanderi saree which she paired with a striped pink blouse and jhumkas. The additon of a bindi and hair in bun completes this gorgeous look . A nice way to to spice up Indian weaves is to play with the drapes and Raashi does just that here. She paired this look with a chunky necklace. Choosing the sari route for filmfare awards red carpet Dia mirza looked elegant and graceful. I love the colour combination of yellow and indigo here and the beaded navratan mala fit in nicely with the high neck blouse. Sonam Kapoor loves wearing sarees and looked lovely in this blue saree which she paired with gold earrings. This raw mango saree look has dreamy vintage vibes thanks to the sheer sleeves blouse sonam kapoor wore but i wish the blouse fit her better. 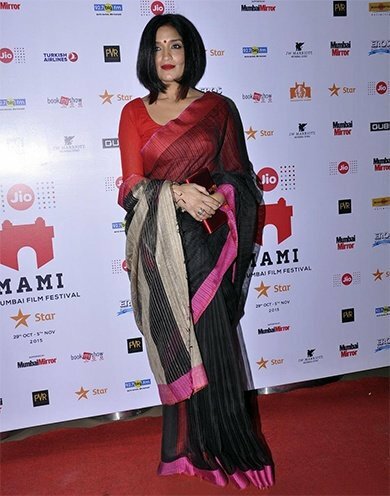 For screening of Angry Indian Goddesses at a Film Festival Sandhya chose a raw Mango saree whih she paired with a red blouse and bindi. Konkana sen Sharma is often spotted in sarees and she looked classic beauty in this white and gold saree. 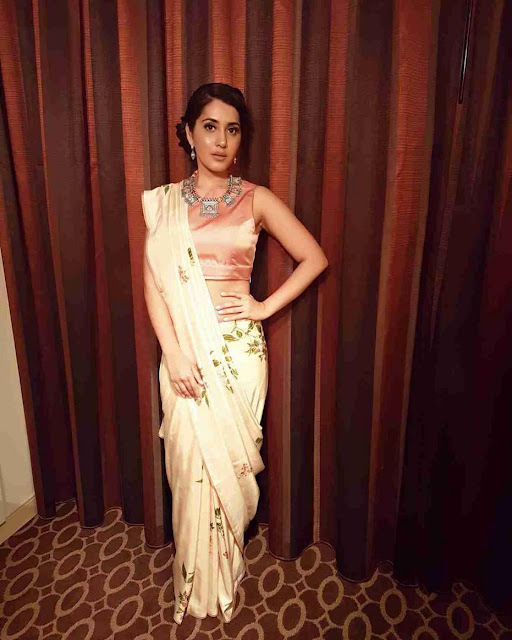 attending the wedding reception of Kunal Kapoor and Soha Ali Khan Konkana kept things festive by pairing the saree with a striped blouse, a neck piece, earrings and potli. Attending Retail Jeweller India Awards Tisca wore a vibrant plaid raw mango saree whih she paired with bindi earrings and a clutch. I dont like the saree much but Tisca sure looks elegant and her blouse gives this look a modern touch. Trust Neha Dhupia to always keep things interesting. Here she pairs a shirt style blouse with a traditional raw mango saree. Where to Buy Raw Mango Sarees ? If you love traditional weaves, a raw Mango saree is definitely on your wish list. Handwoven sarees are actually easily available in India and without the designer tags will cost a lot less but if you really want a Raw Mango because they are innovative and sophisticated versions of traditional handwoven fabric then here is the complete store list to help you buy these timeless sarees. Ogaan | Multi designer boutique in India has some nice raw mango sarees and blouses but many pieces are sold out! *Elan, Hill Plaza, Opp. Sears Towers, Gulbai Tekra, Ahmedabad. * 85 Lansdowne, 85 B , Sarat Bose Rd. * Ensemble, 130/132, Great western bldg, Shahid Bhagat Singh Marg. You Can Buy Raw Mango sarees on all good earth stores. Visit here for complete store list. They have stores in Turkey and istanbul too. I have kept focus on Raw Mango Sarees in this post but that is not the only thing the brand deals in. They also have beautiful handwoven shawls, stoles and dupattas. The new collection also has raw mango lehenga in various designs.